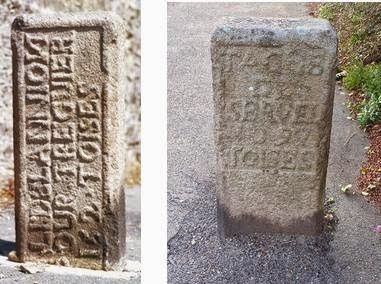 These boundary markers, still fairly plentiful along the roads of France, represent the last tangible reminders of the corvée, the system of forced labour on the roads which was to become the very symbol of ancien régime archaism and inequities. 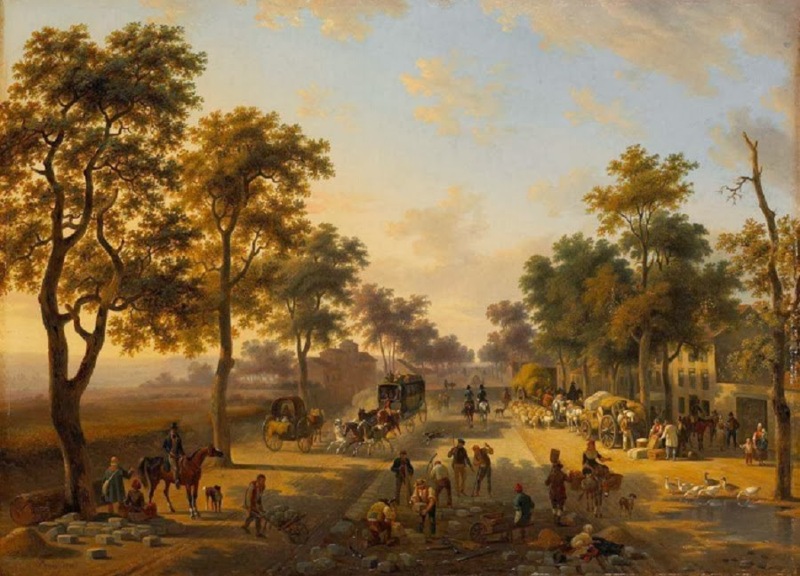 It comes as a surprise to learn that the imposition of compulsory labour on the roads was not in fact some hangover from the feudal past, but an central government initiative laid out in legislation for the first time in only in 1738. In contrast to England, where roads were paid for by tolls and turnpikes, French administrators sought to finance road construction and maintenance through taxation. To Controller General Orry, the corvée mobilised those subject to the taille for construction projects of benefit to the local population, whilst avoiding increases in the tax burden. (According to Necker, the corvée of 1789 yielded the equivalent in labour of 20 million livres in cash). 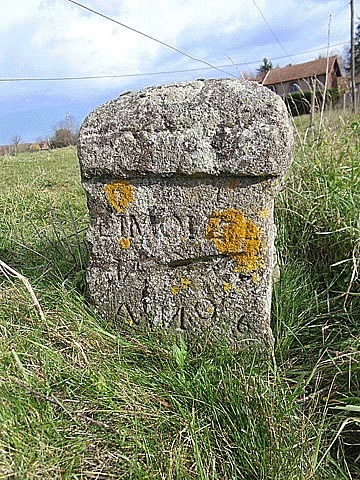 The administrative machine in the form of royal engineers and inspectors already reached far into the provinces and the mechanism for the mobilisation of peasant labour was now put into place (though responsibility for roads was uneasily maintained by the provincial Estates in Burgundy, Languedoc, Britanny and Provence). Typically the engineer responsible for a given task would first draw up a detailed estimate of the length, width and gradient of the road to be built or repaired, the nature and the quantity of work to be done (excavation, embanking, paving etc. ), and the number of parishes along the roads which would be involved; as well as labour, the parishes were obliged to provide carts, horses and tools. 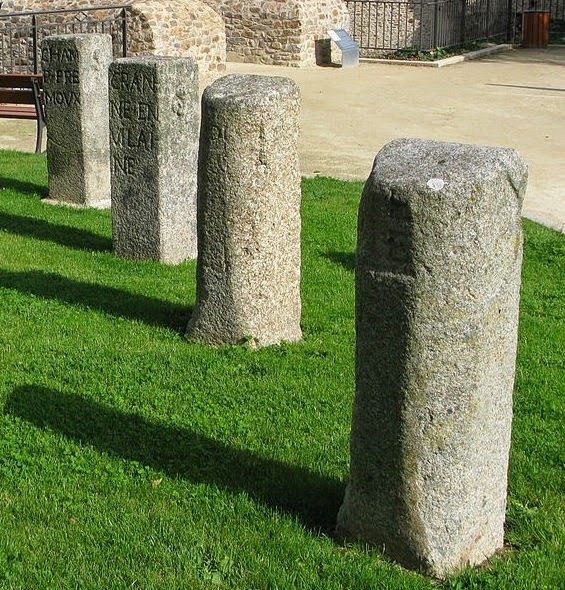 An edict was then published which announced the date on which work would commence and the engineer, with his subdélégué, would assign tasks to the assembled labourers - to fill ruts, to excavate, to quarry stone or gravel, or to transport material to the site. For safety's sake, stakes were normally placed around the stretch of road concerned. Workers were usually organised into teams of eight or ten with foremen known as picqueurs and were forbidden to leave until the deadline for the completion. If sufficient labourers failed to appear, the work could be given to a building contractor at the parish's expense. Unsurprisingly the corvée was profoundly unpopular: though in theory only a few days work, the burden fell unevenly and could cause serious hardship by diverting effort from the fields. In the great road building initiative under Trudaine in the late 1740s, the marquis d'Argenson characterised this use of "forced and unpaid labour" along the major highways as "the most horrible tax ever yet endured". Fine roads and highways were all very well but in his native Touraine haste to complete the work was crushing the population within a circuit of a dozen miles. The demand for labour and subsistence were simply beyond the capacity of parishes to meet. Peasants were kept from their harvests, paid a pittance for their carts, and villages became depopulated as men we driven to take to take refuge in the towns. On the other side, administrators found the corvéables unwilling and unskilled and the short-term nature of their commitment inconvenient. As a consequence the practice of commuting the corvée and employing professional contractors gradually gained ground and was favoured by reforming intendants such as Orceau de Fontette in Normandy (1758) and Turgot in Limousin( 1762) who agreed a lump sum with parishes in place of statute work. By the 1760s, as noisy clashes grew between peasants and engineers, rural communities and royal authorities, commentators increasingly took sides on the merits of the corvée Opponents such as parlementaires of Normandy, Toulouse and Bordeaux, the Physiocrats, and the marquis de Mirabeau, all attacked the hidden taxation of the penalty imposed on production. Publications such as Guillaume Grivel article "Corvée" in the Encyclopédie méthodique of 1784 made much of the analogy with archaic medieval practice and the corvée came increasingly to represent the oppression of arbitrary rule. Nonetheless Turgot's attempts to replace it with a new tax in 1773 caused a furore of protest from defenders of fiscal privilege and it was not until 1787, on the eve of the Revolution, that the practice was formally abolished. Daniel Roche, France in the Enlightenment, Harvard University Press (1998) p.49-50.